Speedcam / landmarks / building / place markers likes gas station on the map. It can help us clearly see the screen. Support the various warning alarm notice: overspeed alarm, limit height, warning signs, turn, change lanes, overtaking, traffic lights, intersection, change lanes. Warm start: <36s. Battery: Built-in 1500 mAh lithium battery. RAM: SDRAM 256MB. ROM: 8GB RAM. Install the latest 2018 map, capacitive screen, smoother touch. Material: ABS. Chip: MTK 2531. Headphone port audio output. Portable design, light weight, easy to carry and convenient to use. Support the various warning alarm notice: overspeed alarm, limit height, warning signs, turn, change lanes, overtaking, traffic lights, intersection, change lanes. Support up to 720p video play: supports AVI/MP4/3GP/WMV/ASF/FLV format. Direct from the best source in electronic rear view mirrors and parking accessories. Operation System: Android 6.0 64Bit. Micro SD: Support Micro SD card up to 32GB. Class 10 higher level. USB Interface: USB 2.0, MINI USB port. The antenna needs to face upwards with a clear view of the sky to get a good signal. High Quality,good for the DIY purpose. (No other stuffs. ). Waterproofing is needed when you install the module outside constantly. Note: This version does not have United States and Canada map. Battery: Built-in 1500 mAh lithium battery. 1 USB cable. Photo: Support jpg/gif/bmp/png. Hot start:<3s (in the open area). This can be for any of the following reasons -. 2020 Updatedas Shown in Pics. 1 Garmin Sand Bag with Goose Neck Mount. 1 Garmin TA20 Antenna Cord / Power / Charging Cord. RAM: SDRAM 256MB. ROM: 8GB RAM. Install the latest 2018 map, capacitive screen, smoother touch. Chip: MTK 2531. Headphone port audio output. Portable design, light weight, easy to carry and convenient to use. Receiver: FM. If you do not receive our reply within 48 hours, pls. If you are satisfied with our service, pls. 1 Data Line. High-speed browsing system, custom quick search, easy to use. When you are tired and want to rest, you can enjoy the movie. RAM: 128MB. E-book: support TXT format of general e-book format, mass storage, can set the speed of automatic page turning, full screen browsing, can use MP3 function while reading. Due to the different display and different light, the picture may not show the actual color of the item. Function: file browser support, photo browser support, audio and video player support (MP3 / MP4), support for FM send. Color: Yellow. 1 Data Line. If you do not receive our reply within 48 hours, pls. Function: file browser support, photo browser support, audio and video player support (MP3 / MP4), support for FM send. 1 Data Line. If you do not receive our reply within 48 hours, pls. If you are satisfied with our service, pls. Portable design, light weight, easy to carry and convenient to use. With back support, can put on the dashboard directly. Working Humidity Range: 45% to 80% RH. Storage Humidity Range: 30% to 90% RH. 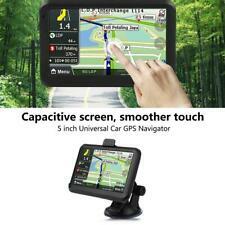 Brand XGODY Model 504 UPC Does not apply MPN C0-00661-1-SC Features 3D Map View Screen Size 5" Type Automotive Mountable, Truck Bundled Items Additional Cable(s) Unit Size 128*82*12mm Bluetooth NO AV IN NO Function Gps Tracking, Warning Function, SpeedCam On Map RAM 128MB Storage Capacity 8GB Resolution 480 x 272 BrandXGODY Model504 CPUMedia Tek MT3351 GPS ModuleHigh Sensitive GPS Receiver Memory Size128MB RAM – 8GB Internal Memory Display Screen5” TFT LCD Display USBUSB Client 2.0, MINI USB 5PIN socket SD SlotMicro SD socket, MAX Micro SD card up to 32GB AudioA: Built-in 1W/ 8 ohm B: Stereo track: 0.25W/CHANEL, single track 8 ohm/1W FMFM transmitter (76.0MHz -108MHz) Transfer the GPS sound to Car,not FM Radio Bluetooth&AV-IN. Support maximum capacity NAND FLASH (8GB) and support FM transmission. Car & Motor Accessories. Motorcycle Accessories. Car & Truck Parts Accessories. Tattoos & Body Art. File browser support, image viewer support, audio and video player support (MP3 / MP4). RAM: 128MB. Map type: Map of Australia. E-book: support TXT format of general e-book format, mass storage, can set the speed of automatic page turning, full screen browsing, can use MP3 function while reading. Brand XGODY Model 560 Manufacturer Part Number Does Not Apply EAN Does not apply Features 3D Map View Screen Size 5" Type Automotive, Truck Bundled Items Additional Cable(s) Unit Size 127*83*12mm Bluetooth No AV IN No Function Gps Tracking, Warning Function, SpeedCam On Map RAM 128MB Storage Capacity 8GB Resolution 480 x 272 MPN Does not apply UPC Does not apply BrandXGODY Model560 CPUMedia Tek MT3351 GPS ModuleHigh Sensitive GPS Receiver Memory Size128MB RAM – 8GB Internal Memory Display Screen5'' TFT LCD Display,Resolution 800*480 USBUSB Client 2.0, MINI USB 5PIN socket SD SlotMicro SD socket, MAX Micro SD card up to 32GB AudioA: Built-in 1W/ 8 ohm B: Stereo track: 0.25W/CHANEL, single track 8 ohm/1W FMFM transmitter (76.0MHz. Model: 560; CPU : MT3351GPS Module :High Sensitive GPS ReceiverMemory Size :128MB RAM â 8GB Internal MemoryDisplay Screen :5â TFT LCD Display,Resolution 480*272USB :USB Client 2.0, MINI USB 5PIN socketSD Slot :Micro SD socket, MAX Micro SD card up to 32GBAudio :A: Built-in 1W/ 8 ohmB: Stereo track: 0.25W/CHANEL, single track 8 ohm/1WFM : FM transmitter (76.0MHz -108MHz)Transfer the GPS sound to Car,not FM RadioBluetooth&AV-IN :NOBattery :Builtâin Li-ion Rechargeable 1500mAhWorking Time : About 1 hourCharging Time :2-3 hours,Sometimes can only charge to 99%Charging Socket :12V DC socketCar Charger :12-36V/1.5ATemperature Range :Operation temperature: -10 Celsius to 60 CelsiusSaving temperature:0 Celsius to 60 CelsiusSize :127mm x83mm x12mmNavigation Sto.